Stonehenge is a Neolithic and Bronze Age megalithic monument located near Amesbury in the English county of Wiltshire, about 8 miles (13 km) north of Salisbury. It is composed of earthworks surrounding a circular setting of large standing stones and is one of the most famous prehistoric sites in the world. Archaeologists believe that the standing stones were erected between 2500 B.C.E. and 2000 B.C.E., although the surrounding circular earth bank and ditch, which constitute the earliest phase of the monument, have been dated to about 3100 B.C.E. 6.1 "Friar's Heel" or the "Sunday Stone"
The site and its surroundings were added to the UNESCO's list of World Heritage Sites in 1986 in a co-listing with Avebury henge monument, and it is also a legally protected Scheduled Ancient Monument. Stonehenge itself is owned and managed by English Heritage, whilst the surrounding downland is owned by the National Trust. The name "Stonehenge" is derived from the Old English words stān meaning "stone," and either hencg meaning "hinge" (because the stone lintels hinge on the upright stones) or hen(c)en meaning "gallows" or "instrument of torture" (Chippendale 2004). Medieval gallows consisted of two uprights with a lintel joining them, resembling Stonehenge's trilithons, rather than looking like the inverted L-shape more familiar today. The "henge" portion has given its name to a class of monuments known as "henges." Archaeologists define henges as earthworks consisting of a circular banked enclosure with an internal ditch. As often happens in archaeological terminology, this is a holdover from antiquarian usage, and Stonehenge cannot in fact be truly classified as a henge site, as its bank is inside its ditch. Despite being contemporary with true Neolithic henges and stone circles, Stonehenge is in many ways atypical. For example, its extant trilithons make it unique. 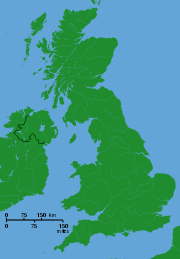 Stonehenge is only distantly related to the other stone circles in the British Isles, such as the Ring of Brodgar. The first recorded excavations at Stonehenge were carried out by William Cunnington and Richard Colt Hoare. In 1798, Cunnington investigated the pit beneath a recently fallen trilithon and in 1810, both men dug beneath the fallen "Slaughter Stone" and concluded that it had once stood up. They may have also excavated one of the Aubrey Holes beneath it. In 1900, William Gowland undertook the first extensive work, establishing that antler picks had been used to dig the stone holes and that the stones themselves had been worked to shape on site. The largest excavation at Stonehenge was undertaken by Lieutenant-Colonel William Hawley and Robert S. Newall after the site had come into state hands. Their work, initially focusing on righting fallen stones, began in 1919 following the transfer of land and continued until 1926. The two men excavated many portions of the features at Stonehenge and were the first to establish that it was a multi-phase site. In 1950, the Society of Antiquaries commissioned Richard Atkinson, Stuart Piggott, and John F.S. Stone to carry out further excavations. 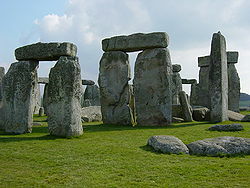 They recovered many cremations and developed the phasing that still dominates much of what is written about Stonehenge. In 1979 and 1980 Mike Pitts led two smaller investigations as part of service trenching, close by the Heelstone. The Stonehenge complex was built in several construction phases spanning 2,000 years, although there is evidence for activity both before and afterward on the site. Dating and understanding the various phases of activity at Stonehenge is not a simple task; it is complicated by poorly-kept early excavation records, surprisingly few accurate scientific dates and the disturbance of the natural chalk by periglacial effects and animal burrowing. The modern phasing most generally agreed by archaeologists is detailed below. Features mentioned in the text are numbered and shown on the Plan of Stonehenge, right, which illustrates the site as of 2004. The plan omits the trilithon lintels for clarity. Holes that no longer, or never, contained stones are shown as open circles and stones visible today are shown colored. Archaeologists have found four (or possibly five, although one may have been a natural tree throw) large Mesolithic post holes which date to around 8000 B.C.E. nearby. These held pine posts around 0.75m (2.4ft) in diameter which were erected and left to rot in situ. Three of the posts (and possibly four) were in an east-west alignment and may have had ritual significance; no parallels are known from Britain at the time, but similar sites have been found in Scandinavia. At this time, Salisbury Plain was still wooded but four thousand years later, during the earlier Neolithic, a cursus monument was built 600m north of the site as the first farmers began to clear the forest and exploit the area. Several other early Neolithic sites, a causewayed enclosure at Robin Hood's Ball and long barrow tombs, were built in the surrounding landscape. The first monument consisted of a circular bank and ditch enclosure (7 and 8) measuring around 110 m (360 feet) in diameter with a large entrance to the north east and a smaller one to the south (14). It stood in open grassland on a slightly sloping but not especially remarkable spot. The builders placed the bones of deer and oxen in the bottom of the ditch as well as some worked flint tools. The bones were considerably older than the antler picks used to dig the ditch and the people who buried them had looked after them for some time prior to burial. The ditch itself was continuous but had been dug in sections, like the ditches of the earlier causewayed enclosures in the area. The chalk dug from the ditch was piled up to form the bank. This first stage is dated to around 3100 B.C.E. after which the ditch began to silt up naturally and was not cleared out by the builders. Within the outer edge of the enclosed area was dug a circle of 56 pits, each around 1m in diameter (13), known as the "Aubrey holes" after John Aubrey, the seventeenth century antiquarian who was thought to have first identified them. 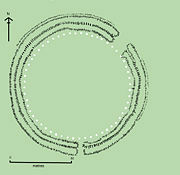 The pits may have contained standing timbers, creating a timber circle, although there is no excavated evidence of them. A small outer bank beyond the ditch could also date to this period (9). Evidence of the second phase is no longer visible. It appears from the number of post holes dating to this period that some form of timber structure was built within the enclosure during the early third millennium B.C.E. Further standing timbers were placed at the northeast entrance and a parallel alignment of posts ran inwards from the southern entrance. The post holes are smaller than the Aubrey Holes, being only around 0.4m in diameter and are much less regularly spaced. The bank was purposely reduced in height and the ditch continued to silt up. At least twenty-five of the Aubrey Holes are known to have contained later, intrusive, cremation burials dating to the two centuries after the monument's inception. It seems that whatever the holes' initial function, it changed to become a funerary one during Phase 2. Thirty further cremations were placed in the enclosure's ditch and at other points within the monument, mostly in the eastern half. Stonehenge is therefore interpreted as functioning as an enclosed cremation cemetery at this time, the earliest known cremation cemetery in the British Isles. Fragments of unburnt human bone have also been found in the ditch fill. Late Neolithic grooved ware pottery has been found in connection with the features from this phase providing dating evidence. Archaeological excavation has indicated that around 2600 B.C.E., timber was abandoned in favor of stone and two concentric crescents of holes (called the Q and R Holes) were dug in the center of the site. Again, there is little firm dating evidence for this phase. The holes held up to 80 standing stones (shown blue on the plan) 43 of which were derived from the Preseli Hills, 250 km away in modern day Pembrokeshire in Wales. Other standing stones may well have been small sarsens, used later as lintels. The far-traveled stones, which weighed about four tons, consisted mostly of spotted dolerite but included examples of rhyolite, tuff, and volcanic and calcareous ash. Each measures around 2m in height, between 1m and 1.5m wide and around 0.8m thick. What was to become known as the "Altar Stone" (1), a six-ton specimen of green micaceous sandstone, twice the height of the bluestones, is derived from either South Pembrokeshire or the Brecon Beacons and may have stood as a single large monolith. The north eastern entrance was also widened at this time with the result that it precisely matched the direction of the midsummer sunrise and midwinter sunset of the period. This phase of the monument was abandoned unfinished however, the small standing stones were apparently removed and the Q and R holes purposefully backfilled. Even so, the monument appears to have eclipsed the site at Avebury in importance towards the end of this phase and the "Amesbury Archer," found in 2002 three miles (5 km) to the south, would have seen the site in this state. The "Heelstone" (5) may also have been erected outside the north eastern entrance during this period although it cannot be securely dated and may have been installed at any time in phase 3. At first, a second stone, now no longer visible, joined it. Two, or possibly three, large portal stones were set up just inside the northeastern entrance of which only one, the fallen "Slaughter Stone" (4)', 16 ft (4.9 m) long, now remains. 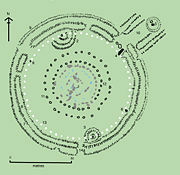 Other features loosely dated to phase 3 include the four "Station Stones" (6), two of which stood atop mounds (2 and 3). The mounds are known as "barrows" although they do not contain burials. The "Avenue" (10), a parallel pair of ditches and banks leading 3 km to the River Avon was also added. Ditches were later dug around the Station Stones and the Heelstone, which was by then reduced to a single monolith. The next major phase of activity at the tail end of the third millennium B.C.E. saw 30 enormous sarsen stones (shown gray on the plan) brought from a quarry around 24 miles (40 km) north, to the site on the Marlborough Downs. 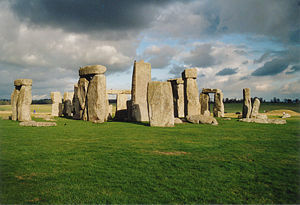 The stones were dressed and fashioned with mortise and tenon joints before 30 were erected as a 33 m (108 ft) diameter circle of standing stones with a "lintel" of 30 stones resting on top. The lintels were joined to one another using another woodworking method, the tongue in groove joint. Each standing stone was around 4.1 m (13.5 feet) high, 2.1 m (7.5 feet) wide and weighed around 25 tons. Each had clearly been worked with the final effect in mind; the orthostats widen slightly towards the top in order that their perspective remains constant as they rise up from the ground whilst the lintel stones curve slightly to continue the circular appearance of the earlier monument. The sides of the stones that face inwards are smoother and more finely worked than the sides that face outwards. The average thickness of these stones is 1.1 m (3.75 feet) and the average distance between them is 1 m (3.5 feet). A total of 74 stones would have been needed to complete the circle and unless some of the sarsens were removed from the site, it would seem that the ring was left incomplete. Of the lintel stones, they are each around 3.2 m long (10.5 feet), 1 m (3.5 feet) wide and 0.8 m (2.75 feet) thick. The tops of the lintels are 4.9 m (16 feet) above the ground. The images of a dagger and 14 axe-heads have been recorded carved on one of the sarsens, known as stone 53. Further axe-head carvings have been seen on the outer faces of stones known as numbers 3, 4, and 5. They are difficult to date but are morphologically similar to later Bronze Age weapons; recent laser scanning work on the carvings supports this interpretation. The pair of trilithons in north east are smallest, measuring around 6 m (20 feet) in height and the largest is the trilithon in the south west of the horseshoe is almost 7.5 m (24 feet) tall. This ambitious phase is radiocarbon dated to between 2440 and 2100 B.C.E. Later in the Bronze Age, the bluestones appear to have been re-erected for the first time, although the precise details of this period are still unclear. They were placed within the outer sarsen circle and at this time may have been trimmed in some way. A few have timber working-style cuts in them, like the sarsens themselves, suggesting they may have been linked with lintels and part of a larger structure during this phase. This phase saw further rearrangement of the bluestones, as they were placed in a circle between the two settings of sarsens and in an oval in the very center. Some archaeologists argue that some of the bluestones in this period were part of a second group brought from Wales. 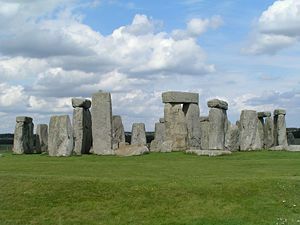 All the stones were well-spaced uprights without any of the linking lintels inferred in Stonehenge 3 III. 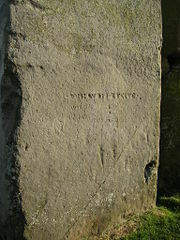 The Altar Stone may have been moved within the oval and stood vertically. Although this would seem the most impressive phase of work, Stonehenge 3 IV was rather shabbily built compared to its immediate predecessors, the newly re-installed bluestones were not at all well founded and began to fall over. However, only minor changes were made after this phase. Stonehenge 3 IV dates from 2280 to 1930 B.C.E. Soon afterward, the north eastern section of the Phase 3 IV Bluestone circle was removed, creating a horseshoe-shaped setting termed the Bluestone Horseshoe. This mirrored the shape of the central sarsen Trilithons and dates from 2270 to 1930 B.C.E. This phase is contemporary with the famous Seahenge site in Norfolk. Two further rings of pits were dug outside the outermost sarsen circle, called the Y and Z Holes (11 and 12). The Z holes were about 2m outside the outermost sarsen circle and the Y holes about 5m further out. These were each of thirty pits and each seems to match with one of the uprights in the outer sarsen circle. They were never filled with stones, however, and were permitted to silt up over the next few centuries; their upper fills contain Iron Age and Roman material. Monument building at Stonehenge appears to have ended around 1600 B.C.E. Even though the last known construction of Stonehenge was about 1600 B.C.E., and the last known usage of Stonehenge was during the Iron Age (if not as late as the seventh century), where Roman coins, prehistoric pottery, an unusual bone point, and a skeleton of a young male (780-410 B.C.E.) were found, it is unknown whether Stonehenge was in continuous use or exactly how it was used. The burial of a decapitated Saxon man has also been excavated from Stonehenge, dated to the seventh century. The site was known by scholars during the Middle Ages and since then it has been studied and adopted by numerous different groups. The engraved weapons on the sarsens are unique in megalithic art in the British Isles, where more abstract designs were invariably favored. Similarly, the horseshoe arrangements of stones are unusual in a culture that otherwise arranged stones in circles. The axe motif is, however, common to the peoples of Brittany at the time, and it has been suggested at least two stages of Stonehenge were built under continental influence. This would go some way towards explaining the monument's atypical design, but overall, Stonehenge is still inexplicably unusual in the context of any prehistoric European culture. Much speculation has surrounded the engineering feats required to build Stonehenge. Assuming the bluestones were brought from Wales by hand, and not transported by glaciers, as Aubrey Burl claimed, various methods of moving them relying only on timber and rope have been suggested. In 2001, as an exercise in experimental archaeology, an attempt was made to transport a large stone along a land and sea route from Wales to Stonehenge. Volunteers pulled it for some miles (with great difficulty) on a wooden sled over land, using modern roads and low-friction netting to assist sliding, but once transferred to a replica prehistoric boat, the stone sank in Milford Haven, before it even reached the rough seas of the Bristol Channel. As far as positioning the stones, it has been suggested that timber A-frames were erected to raise the stones, and that teams of people then hauled them upright using ropes. The topmost stones may have been raised up incrementally on timber platforms and slid into place or pushed up ramps. The carpentry-type joints used on the stones imply a people well skilled in woodworking and they could easily have had the knowledge to erect the monument using such methods. In 2003, retired carpenter Wally Wallington demonstrated ingenious techniques based on fundamental principles of levers, fulcrums, and counterweights to show that a single man can rotate, walk, lift, and tip a ten-ton cast-concrete monolith into an upright position. Estimates of the manpower needed to build Stonehenge put the total effort involved at millions of hours of work. Stonehenge 1 probably needed around 11,000 man-hours (or 460 days) of work, Stonehenge 2 around 360,000 (15,000 days or 41 years) and the various parts of Stonehenge 3 may have involved up to 1.75 million hours (73,000 days or 200 years) of work. The working of the stones is estimated to have required around 20 million hours (830,000 days or 2,300 years) of work using the primitive tools available at the time. Certainly, the will to produce such a site must have been strong, and it is considered that advanced social organization would have been necessary to build and maintain it. British archaeologist Roger Mercer has observed that the bluestones are incongruously finely worked and has suggested that they were transferred to Salisbury Plain from an as yet unlocated earlier monument in Pembrokeshire. J. F. S. Stone (1958) felt that a Bluestone monument had earlier stood near the Stonehenge cursus and been moved to their current site from there. If Mercer's theory is correct then the bluestones may have been transplanted to cement an alliance or display superiority over a conquered enemy although this can only be speculation. Oval shaped settings of bluestones similar to those at Stonehenge 3IV are also known at the sites of Bedd Arthur in the Preseli Hills and at Skomer Island off the southwest coast of Pembrokeshire. Some archaeologists have suggested that the igneous bluestones and sedimentary sarsens had some symbolism, of a union between two cultures from different landscapes and therefore from different backgrounds. Recent analysis of contemporary burials found nearby, known as the Boscombe Bowmen, has indicated that at least some of the individuals associated with Stonehenge 3 came either from Wales or from some other European area of ancient rocks. Petrological analysis of the stones themselves has verified that they could only have come from the Preseli Hills and it is tempting to connect the two. The main source of the bluestones is now identified with the dolerite outcrops around Carn Menyn, although work led by Olwen Williams-Thorpe has shown that other bluestones came from outcrops up to 10 km away. Aubrey Burl (2001) and a number of geologists and geomorphologists have contended that the bluestones were not transported by human agency at all and were instead brought by glaciers at least part of the way from Wales during the Pleistocene. There is good geological and glaciological evidence that glacier ice did move across Preseli and did reach the Somerset coast. However, it is uncertain that it reached Salisbury Plain, and no further specimens of the unusual dolerite stone have so far been found in the vicinity. One current view is that glacier ice transported the stones as far as Somerset, and that they were collected from there by the builders of Stonehenge. Many early historians were influenced by supernatural folktales in their explanations. Some legends held that Merlin the wizard had a giant build the structure for him or that he had magically transported it from Mount Killaraus in Ireland, while others held the Devil responsible. Henry of Huntingdon was the first to write of the monument around 1130, soon followed by Geoffrey of Monmouth who was the first to record fanciful associations with King Arthur which led the monument to be incorporated into the wider cycle of European medieval romance. The first academic effort to survey and understand the monument was made around 1640 by John Aubrey. He declared Stonehenge the work of Druids. This view was greatly popularized by William Stukeley. Aubrey also contributed the first measured drawings of the site, which permitted greater analysis of its form and significance. From this work, he was able to demonstrate an astronomical or calendrical role in the stones' placement. 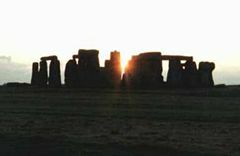 Stonehenge is aligned northeast–southwest, and it has been suggested that particular significance was placed by its builders on the solstice and equinox points, so for example, on a midsummer's morning, the sun rose close to the Heelstone, and the sun's first rays went directly into the center of the monument between the horseshoe arrangement. It is unlikely that such an alignment is merely accidental. A huge debate was triggered by the publication of Stonehenge Decoded, by British born astronomer Gerald Hawkins, who claimed to see a large number of astronomical alignments, both lunar and solar, at the site and argued that Stonehenge could have been used to predict eclipses. Hawkins' book received wide publicity, partly because he used a computer in his calculations, then a rarity. Further contributions to the debate came from British astronomer C. A. Newham and Sir Fred Hoyle, the famous Cambridge cosmologist, as well as by Alexander Thom, a retired professor of engineering, who had been studying stone circles for more than 20 years. Their theories faced criticism from Richard Atkinson and others who have suggested impracticalities in the "Stone Age calculator" interpretative approach. The consensus is that most of the astronomical case, although not all, was overstated. Many archaeologists believe Stonehenge was an attempt to render in permanent stone the more common timber structures that dotted Salisbury Plain at the time, such as those that stood at Durrington Walls. Modern anthropological evidence has been used by Mike Parker Pearson and the Malagasy archaeologist Ramilisonina to suggest that timber was associated with the living and stone with the ancestral dead amongst prehistoric peoples. They have argued that Stonehenge was the terminus of a long, ritualized funerary procession for treating the dead, which began in the east, during sunrise at Woodhenge and Durrington Walls, moved down the Avon and then along the Avenue reaching Stonehenge in the west at sunset. The journey from wood to stone via water was, they consider, a symbolic journey from life to death. There is no satisfactory evidence to suggest that Stonehenge's astronomical alignments were anything more than symbolic and current interpretations favor a ritual role for the monument that takes into account its numerous burials and its presence within a wider landscape of sacred sites. Many also believe that the site may have had astrological and/or spiritual significance attached to it. Stonehenge's fame comes not only from its archaeological significance or potential early astronomical role but also in its less tangible effect on visitors, what Christopher Chippindale (2004) described as "the physical sensation of the place," something that transcends the rational, scientific view of the monument. This manifests itself in the spiritual role of the site for many different groups, and a belief that no single scientific explanation can do justice to it as a symbol of the great achievement of the ancient Britons and something that continues to confound mainstream archaeology. Some people claim to have seen UFOs in the area (perhaps connected with the military installations around Warminster) that has led to ideas of it being an extraterrestrial landing site. Alfred Watkins found three ley lines running through the site and others have employed numerology, dowsing, or geomancy to reach diverse conclusions regarding the site's power and purpose. New Age and neo-pagan beliefs might see Stonehenge as a sacred place of worship which can conflict with its more mainstream role as an archaeological site, tourist attraction, or marketing tool. Post-processualist archaeologists might consider that treating Stonehenge as a computer or observatory is to apply modern concepts from the contemporary technology-driven era back into the past. Even the role of indigenous peoples in archaeology, rarely applied in Western Europe, has created a new function for the site as a symbol of Welsh nationalism. The significance of the "ownership" of Stonehenge in terms of the differing meanings and interpretations held by the many orthodox and unorthodox stakeholders in the site has been increasingly apparent in recent decades. Researchers (Blain and Wallis) have pointed to the huge variety of views which show the continued and growing importance of Stonehenge, as symbol and "Icon of Britishness;" and indicate also the increased awareness of pasts by many people with no training in archaeology or heritage. For many, Stonehenge and other ancient monuments form part of the "living landscape" which holds its own stories and which is there to be engaged with as people mark the seasons of the year. Today's mythology around Stonehenge includes the recent history of the "Battle of the Beanfield" and the previous Free festivals. Stonehenge has not one meaning but many. Today, curators from English Heritage facilitate "managed open access" at solstices and equinoxes, with some disputes over the days on which these fall. Blain and Wallis argue that issues over access relate not only to physical presence at the stones but to interpretations of past and validity of new-indigenous and pagan usages in the present and such alternative views have been central in alerting public awareness to the issues of roads, tunnels, and landscape. "Friar's Heel" or the "Sunday Stone"
The Devil bought the stones from a woman in Ireland, wrapped them up, and brought them to Salisbury plain. One of the stones fell into the Avon, the rest were carried to the plain. The Devil then cried out, "No-one will ever find out how these stones came here." A friar replied, "That's what you think!" whereupon the Devil threw one of the stones at him and struck him on the heel. The stone stuck in the ground and is still there. Some claim "Friar's Heel" is a corruption of Freyja's He-ol or Freyja Sul, from the Nordic goddess Freyja and (allegedly) the Welsh words for "way" and "Friday" respectively. Stonehenge is also mentioned within Arthurian legend. Geoffrey of Monmouth said that Merlin the wizard directed its removal from Ireland, where it had been constructed on Mount Killaraus by giants, who brought the stones from Africa. After it had been rebuilt near Amesbury, Geoffrey further narrates how first Ambrosius Aurelianus, then Uther Pendragon, and finally Constantine III, were buried inside the ring of stones. In many places in his Historia Regum Britanniae Geoffrey mixed British legend and his own imagination; it is intriguing that he connects Ambrosius Aurelianus with this prehistoric monument, seeing how there is place-name evidence to connect Ambrosius with nearby Amesbury. 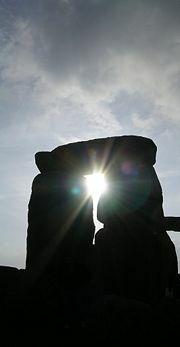 The sun rising over Stonehenge on the Summer solstice 2005 (21 June). By the beginning of the twentieth century a number of the stones had fallen or were leaning precariously, probably due to the increase in curious visitors clambering on them during the nineteenth century. Three phases of conservation work were undertaken which righted some unstable or fallen stones and carefully replaced them in their original positions using information from antiquarian drawings. Stonehenge is a place of pilgrimage for neo-druids and those following pagan or neo-pagan beliefs. 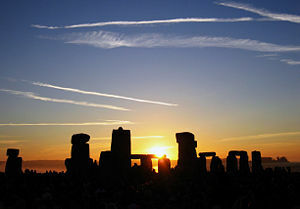 The midsummer sunrise began attracting modern visitors in 1870s, with the first record of recreated Druidic practices dating to 1905 when the Ancient Order of Druids enacted a ceremony. 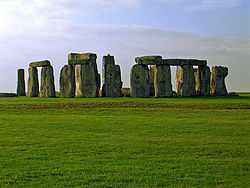 Despite efforts by archaeologists and historians to stress the differences between the Iron Age Druidic religion, the much older monument, and modern Druidry, Stonehenge has become increasingly, almost inextricably, associated with British Druidism, Neo Paganism and New Age philosophy. The earlier rituals were augmented by the Stonehenge free festival, held between 1972 and 1984, and loosely organized by the Politantric Circle. However, in 1985 the site was closed to festival goers by English Heritage and the National Trust, by which time the number of midsummer visitors had risen from 500 to 30,000. A consequence of the end of the festival was the violent confrontation between the police and new age travelers that became known as the Battle of the Beanfield when police blockaded a convoy of travelers to prevent them from approaching Stonehenge. There was then no midsummer access for almost fifteen years until limited opening was negotiated in 2000. A plan for a new highway access and heritage center were proposed in 1993, but in July 2005, these plans were thrown into uncertainty following refusal of planning permission for the visitors' center by Salisbury District Council whilst the British government placed the rising costs of the road scheme under review. In 2013, a comprehensive plan to build a visitor center and reroute traffic away from Stonehenge and so protect the area was put in place. There is a full-size replica of Stonehenge as it would have been before decay at Maryhill in Washington state, built by Sam Hill as a war memorial. Stonehenge Aotearoa in the Wairarapa region of New Zealand is a modern adaptation aligned with the astronomy seen from the Antipodes, built by the Phoenix Astronomical Society from wood and sprayed concrete. The University of Missouri at Rolla has a half-scale replica located on campus, and East Stroudsburg University in East Stroudsburg, Pennsylvania, has a small replica on its campus, dubbed "Stroudhenge." Blain, Jenny and Robert J. Wallis. Sacred Sites, Contested Rites/Rights. Retrieved June 20, 2007. Hawley, William. Report on the Excavations at Stonehenge during the season of 1923. The Antiquaries Journal 5, Oxford University Press, 1925. Hutton, Ronald. "From Universal Bond to Public Free For All." British Archaeology 83, 2005. Newall, R.S. Stonehenge, Wiltshire (Ancient monuments and historic buildings). London: Her Majesty's Stationery Office, 1959. Pitts, M.W. "On the Road to Stonehenge: Report on Investigations beside the A344 in 1968, 1979 and 1980." Proceedings of the Prehistoric Society 48, 1982. All links retrieved June 27, 2013. Council for British Archaeology—The Stonehenge Saga. English Heritage guide to Stonehenge. The Forgotten Technology Wally Wallington's techniques for moving massive cast-concrete blocks easily. Stonehenge Aotearoa Astronomy Centre—a full-scale working adaptation of Stonehenge based in New Zealand. 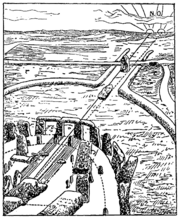 Stonehenge, by Frank Stevens, 1916, from Project Gutenberg. Stonehenge: Mystery on the Salisbury Plain. Tiverton Astronomy Society—Astro-Archaeology at Stonehenge—supposed astronomical alignments at the monument. Virtual Reality image of Stonehenge at Dawn. New glacier theory on Stonehenge. This page was last modified on 28 June 2013, at 19:21.